When building a room addition it is important to carefully consider the room addition size. If the family room addition size, for example, is built too small you will be forever kicking yourself for not spending enough time and money for doing it right when you had the chance. Or, if the family room addition size is too big you may end up with this giant mass of a home that looks more like a transformer figure than a beautiful and spacious home. 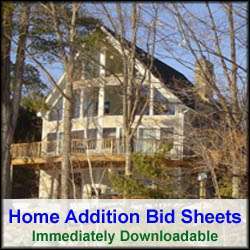 When developing your room addition plans there are number of factors to evaluate when debating a room addition size. First, you need to be clear on the purpose of the room addition. You need to ask yourself – why are you creating the new room addition living space. Is it for a new bedroom, a family room, a kitchen or some combination thereof? Once you clearly have determined the purpose of the space you can then assess how much you need for its intended purpose. If for example the addition is for creating a family room, you can properly assess the room addition size for comfortably fitting in expected furniture and for open space. When developing room addition plans it is very important to understand how the new addition will impact the overall market value of your home. More specifically, you want to have a clear understanding of how much you could expect to increase the value of your home by building a room addition. 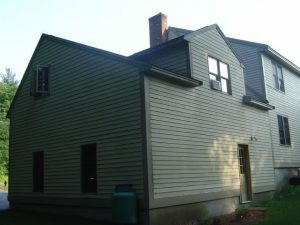 Two key items to consider when making this assessment is how much additional living space will the room addition add, and how will the curb appeal of the home be enhanced. These two items don’t always go hand in hand. For example, if the room addition size is large you will obtain significantly more square footage to the home, and thus think you could justify a proportionally much higher price for the home. This may not always be the case however. If the room addition negatively enhances the curb appeal of the home it could actually counteract the theoretical increase in market value of the large room addition size. The key take away from this is that it is important to make sure that the room addition size does not dwarf or take away the aesthetics and curb appeal of the rest of the home. It is also important to remember to not to skimp on a room addition size to attempt to save a few dollars on room addition costs. 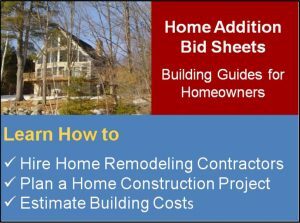 Much of the cost of building a room addition is associated with the inertia of getting the various contractor trades on site. For example, much of the cost of getting a foundation hole dug and foundation walls poured is about hiring the contractor(s) and getting them on the site to do the work. Increasing the length and/or width of a foundation wall by a couple of feet will have an overall negligible cost difference, though it may represent to your room addition size another 10% extra in square footage. The bottom line, don’t be penny wise and pound foolish. You only have one chance to build a room addition right. So by properly determining a room addition size, and generating a set of precise family room addition plans, during the design/concept phase, you can be sure to create adequate new living space that enhances both the look and the value of your home, and get accurate room addition estimates.